Swarming honey bees is one of the wonders of nature. This is a natural way for the colony to divide itself and look for a new home. Swarming honey bees are not aggressive and are usually not a threat to anyone, they are just in search of a new home. We can help rescue these bees so please call. 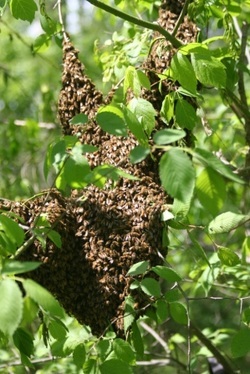 Timing is critical because after a swarm has landed, it may only be there for an hour or two before it will move to its permanent home. Sometimes a hanging swarm may be there overnight, but not usually.